With Code-A-Pillar, Development Really Comes Into Play! See what develops as kids play with Code-a-pillar. Problem-Solving Skills Once kids can 'program' a path for Code-a-pillar, the sky's the limit! It opens the door to problem solving as they figure out how to get Code-a-pillar to go wherever they want! Planning and Sequencing Skills After rearranging his segments a few times, kids will discover that if they plan out a path for Code-a-pillar and put his pieces together in the right sequences, they can get him to follow it! 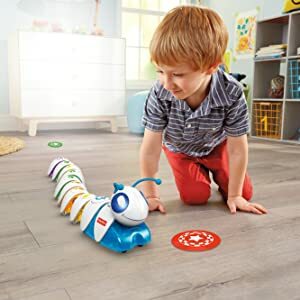 Critical Thinking Skills The more kids rearrange Code-a-pillar pieces, they more they develop critical thinking skills by 'programming' different combinations to send him in different directions! Make Lots Of Fun Connections! ​Can your child make Code-a-pillar go from 'Start' to 'Finish'? Place the 'Start' and 'Finish' targets on the floor. The path he takes to get there is up to your preschooler! Or you can turn any room into an obstacle course! Have your child figure out how to rearrange Code-a-pillar to send him under a table or around a chair. Or draw a map together and see if you can get Code-a-pillar to follow it!